This page is about scrapbooking for beginners - after all, it doesn't have to be complicated. Do all the supplies, the variety of layouts, and terms like "cropping" intimidate you? Making an album can be very simple with amazing results. Sure, if you really get into the hobby you can make your pages as intricate and artistic as you wish. But if you are just starting out, keep it simple. Remember the ultimate goal: preserving your memories and getting those photos into a book so they can be enjoyed! 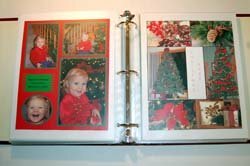 This article is intended to introduce you to making scrapbooks if you are beginner. 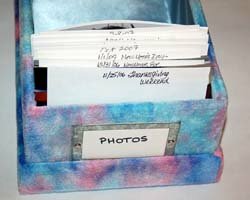 I will explain how to organize your photos, the basic supplies needed, types of albums, and basic techniques to make a simple page. Use the table of contents below to jump down the page if a category interests you, or just read the article in its entirety. Let's get started! It is important to regularly take the photos off your memory card of your digital camera, or the photos from your phone, and archive them on your computer. How often you do this is up to you, but do make this a habit. I realize this is a common problem for many people, but think of it this way... to really get to see your photos well you need to get them on your computer so you can view them on your computer's photo viewer. Even though the picture viewers on cameras are getting larger and larger these days, it is always best to see them big to get a real sense of the photo. Take advantage of using "cloud" services that are readily available, they will do the backups for you! Organize your photos into a folder into your computer called "My Photos" or something similar. Within the folder, make individual folders titled with the date and a description of the event, such as "11-12-08 Keri's Birthday Party". Then copy the photos from your memory card into this folder, and delete them from your memory card to save space. Look at each photo after it is copied into the folder, and delete any you do not want. It is also a good idea to back up your photo folders twice a year (or more often if you take a lot of photos) to an external hard drive. In addition, many websites offer free photo sharing, which also is a back up of all your photos. A good way to stay organized is to print off digital photos that you plan to scrapbook soon. I scrapbook with my sister once per week, so I keep about a six month supply of photos printed out to work with. When I'm through with those photos, I print off another six month supply of photos. Although it takes about an hour or so to look through my photos and decide which I want to print, I only need to devote that time a few times a year. This also allows me to take advantage of the online photo services, such as Shutterfly, which gives you a great savings to pre-order photos in bulk for a reduced price. It also saves on shipping to have 200 photos shipped to you instead of just 25 or so. When my photos arrive in the mail, I refer back to my computer and look up each event with the date. I place the photos in a shoe box (or a photo box that they sell for this purpose), stacked in chronological order. I place an index card in between the photo events, marked with the date and event name. This way, when I go scrapbooking to my sister's house, I grab the next event's photos and everything stays very organized. If you own a regular camera and get your film developed, you can stay organized the same way. Develop your film as you are ready to archive it, or get it all developed and keep them in a photo box. Refer back to your calendar and keep track of the dates the photos were taken, and divide the events with an index card labeled with the date and event name.